peiker acustic GmbH & Co. KG have been successfully producing hands-free equipment, phone modules etc. for the automotive industry, for a long time. Because of this vast experience in RF components, they have been charged with mass-producing eCall modules for various manufacturers. 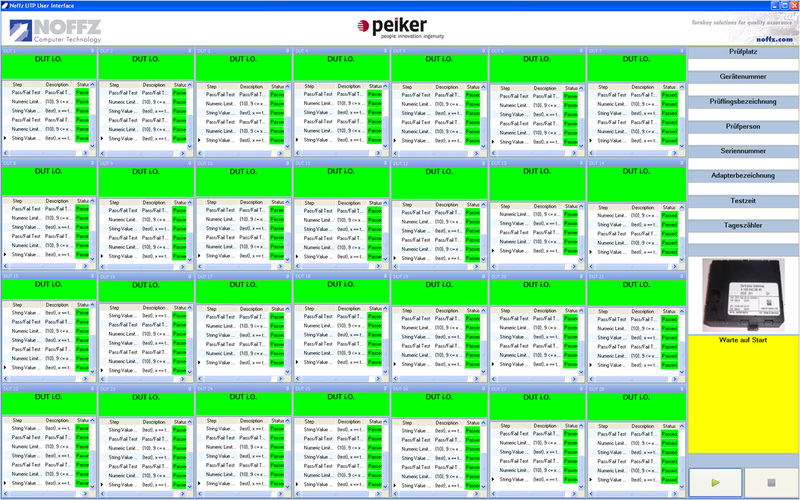 Therefore peiker required a RunIn-Screening tester which was capable of testing up to 28 eCall modules within a climate cabinet. It should offer comprehensive variant management, because eCall modules exhibit different circuit board layouts and contact sections depending on the manufacturer of the vehicle they are destined for. peiker required a robust test system which was suitable for conducting RunIn and Screening tests within a temperature range from -40 °C to +85°C. 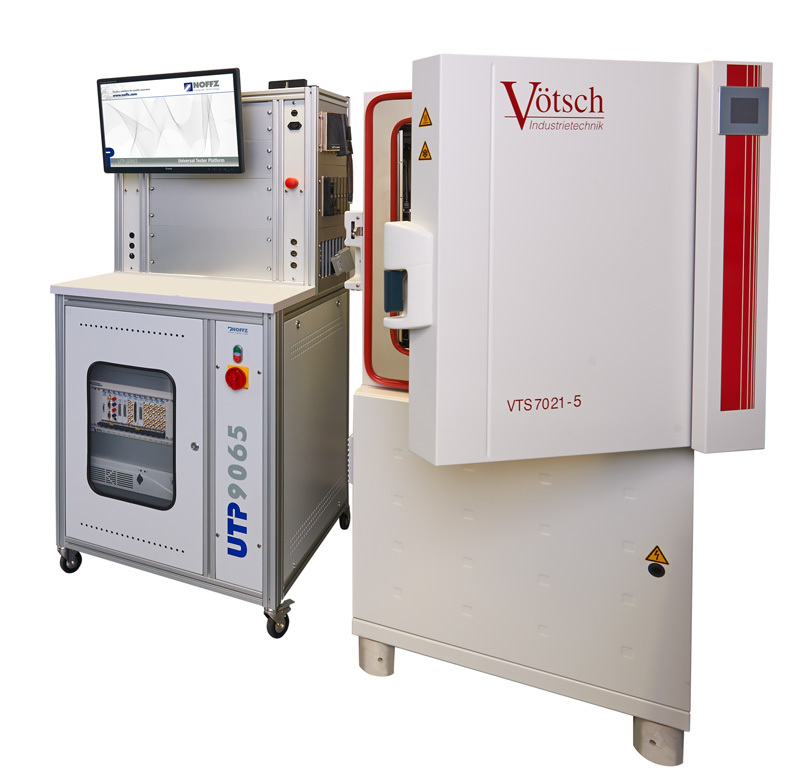 Besides connectivity to the customer’s database and iTAC system, variant management had to allow individual contact sections and measurement sequences for all DUT types and offer assignment of module specific temperature curves. In order to achieve short cycle times, as many measurements as possible had to be conducted in parallel. Code modules for test steps as well as flow control mechanisms had to be implemented by means of LabVIEW and TestStand. Flow control is based on NOFFZ’s UTP TEF (Test Execution Frontend), which has already been standardized for DUT batch processing. In order to achieve optimized, parallel test execution, the respective process model has to be adjusted according to the requirements of the eCall modules. 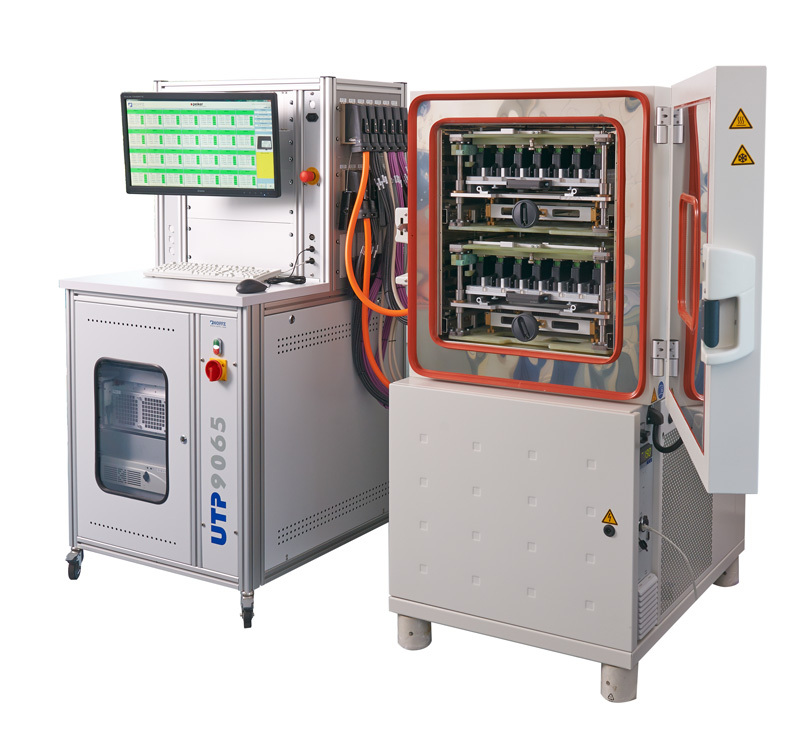 Screening tests inside a climate cabinet always result in extensive warm-up und cooling periods causing long overall test cycle times. These cycle times were not allowed to be further enlarged by the measurements themselves. Due to a cooling period ending at -40°C followed by a warm-up period ending at +85°C the overall cycle time including two measurement periods amounts to 185 minutes. During the implementation of this test system, several challenges had to be faced: First of all, the great number of DUTs resulting in a high degree of parallelization had to be dealt with. The realization of optimized cycle times in spite of long overall processing times is directly linked to this challenge. 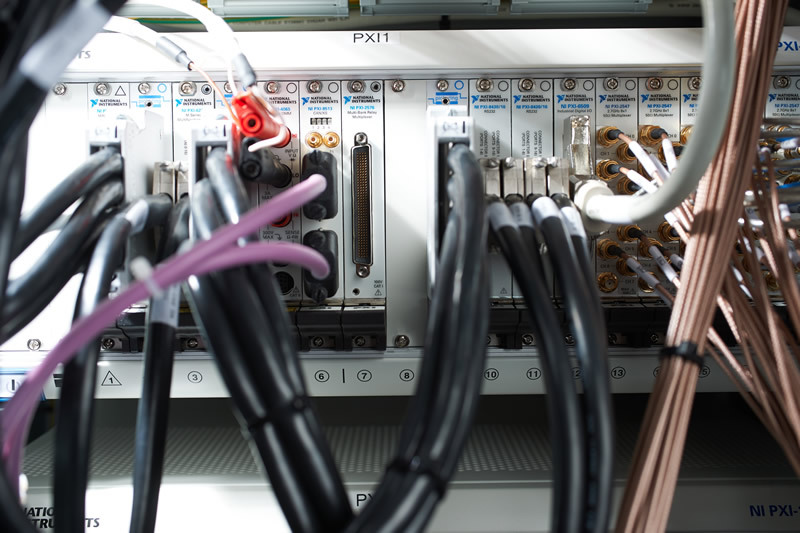 Reliable connectivity to the customer’s database and MES system including variant and serial number management presented other challenge, because the tester had to be connected to existing software structures. In addition to that, software modules by HPVee had to be transported into the LabVIEW/TestStand framework. 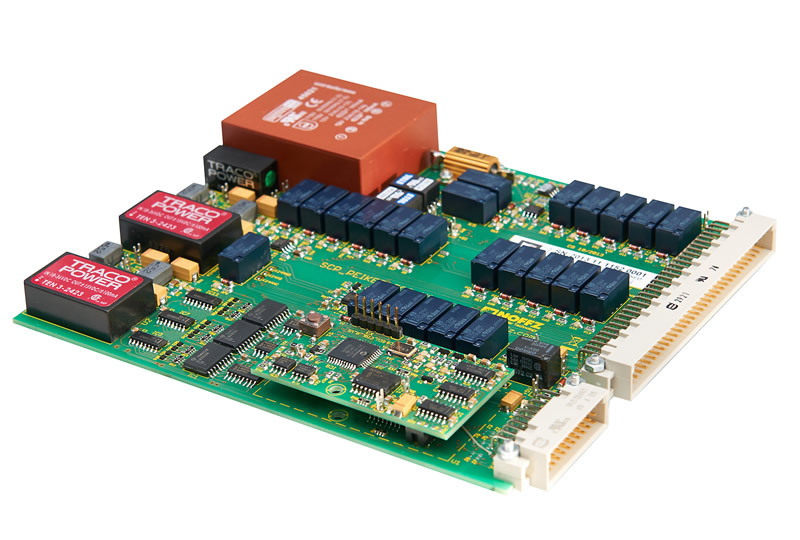 The high number of DUTs could be mastered by means of powerful PXI cards, providing e.g. 32 serial interfaces or 96 I/O channels. Numerous test steps, such as standby current measurement and established of communication could therefore be conducted in parallel. NOFFZ’s TEF for Batch Processing has been expanded for state monitoring of all conducted tests. Due to optimum implementation of parallelism by means of powerful hardware components and consistent software modularization, the demand for short cycle times could finally be met. Based on the customer’s iTAC libraries the database of the traceability system for serial number and test report administration could be connected to the test system. After a successfull implementation of a robust and flexibel RunIn and Screening system for eCall modules based on NOFFZ’s UTP9065 concept, offering comprehensive variant management as well as connectivity to customized data bases and iTAC systems, further replicas of the test system will be assembled, at short notice. Besides full usability for further variants, all replica systems will include an NI-VST allowing for time efficient Non-Signalling tests of call establishement and therefore further reducing cycle times. The high degree of modularization and optimization during software development as well as the standardized variant management due to NOFZZ’s UTP TEF allow for simple and efficient adjustment of test sequences according to new variants and for optimum integration of the VST into the existing tester concept.